It was great to see so many Rotarians and our Better Halves at the event. The Elks Lodge gave us plenty of room for the 150 plus guests. The bounty of food and drinks were only matched by the laughs and smiles we shared. We squeeze that hour of time into our busy lives each week to chat about an idea to raise funds, and that special Rotarian grabs the chance to give and makes the effort to change the World for the better. And so it was that Joe Mindak, made Casino Night an event that has taken on a life of its own. 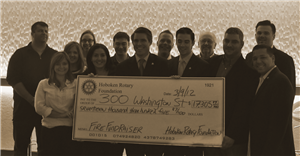 So let us all thank Joe and all that have donated the time, food, drinks and funds to contribute to the corpus of The Hoboken Rotary Foundation. If you participate in Our Events you know the power and benefit of giving in service. I call it getting Rotarized. If you do not then you are missing out on a chance to get something from Our Club that you will rarely find in life. Try it soon as our events are winding down for this year. 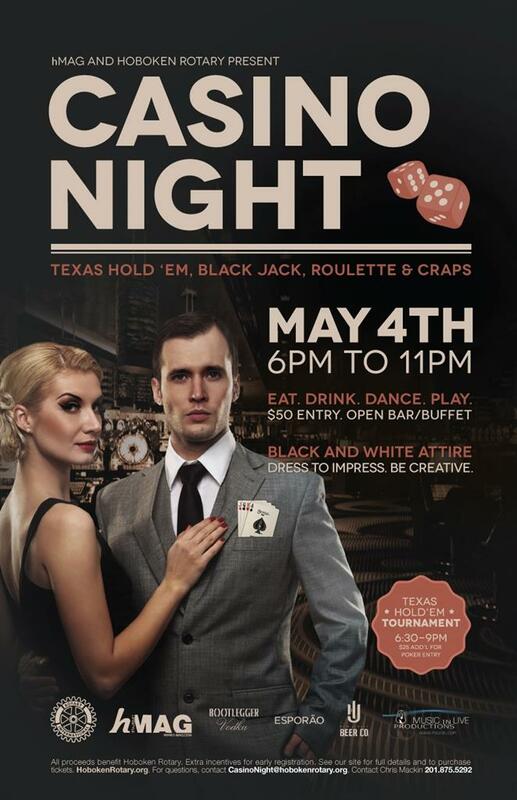 On Saturday, May 4th we will be hosting our 2nd Annual Casino Night. 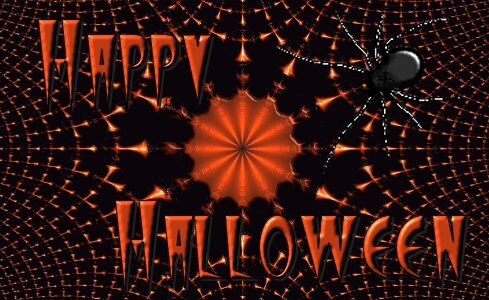 This years event will be held at the Hoboken Elks Lodge from 6pm to 11pm. We will have a Texas Hold'Em Tournament in addition to Black Jack, Roulette & Craps table games. There will be an open bar and buffet. Come EAT.DRINK.DANCE.PLAY with us in Black & White Attire. Dress to Impress. Be Creative! Tickets can be purchased HERE for $50 General Admission or $75 for Texas Hold'Em Registration (which includes all General Admission benefits plus entry into the Texas Hold'Em Tournament). Recently a donation was made to Richard Marsh and his lovely wife to assist them in rebuilding their home. Rich has given so much to Our Community as a Rotarian that he deserves our assistance in his time of need. When I first me Rich he was new to the Club and eager. He was rounding up coats for the homeless and wearing his heart on every coat sleeve! Please do not forget those who need emotional and moral support to recover from the mess left behind. Due to the recent storm, we postponed our 4th Annual Spelling Bee. The committee is working closing with the schools to first ensure that the kids are effectively transitioned back into their routine. Secondly we are seeking out their needs and how we can assist them, getting back up and running smoother and faster. Thirdly we will work with them to determine when a new date and location can be set. 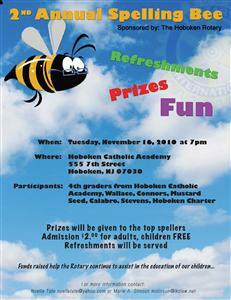 If you have any questions or can assist in the preparations please contact the committee chair, Lisa Russo at spellingbee@hobokenrotary.org. In order to maximize the time we share each week and to further Our Rotary experience and fellowship we are looking for Guest Speakers who have something valuable to talk about. The Brass Rail has notified us that our December 20th meeting is going to be held at The Gas Light, located at 400 Adams St. If you need directions or have any additional questions please let either Chris or Ryan know. We look forward to seeing everyone at our last meeting of 2011. On September 13th, Assemblyman Ruben Ramos will be the guest speaker at our club meeting. Our Club is committed to providing the opportunity for the community's high school seniors to attend college by providing yearly scholarships. The Second Annual Career Shadow Day is this Tuesday, May 24th. High School age kids will shadow Rotarians at their place business. Rotarians will meet their respective students at Panera at 8:30am. Any Rotarian that has not received an email from Ron, please email him directly or send an email to info at hobokenrotary dot org. The students will complete their shadowing and then will be invited to attend our weekly meeting. Any member that is not participating in Career Shadow can still be a big part of the students' day as we discuss all the various careers of our members, as well as the individual experiences of the kids during their shadow experience. In an effort to support one of our Interact club's fundraising efforts, we are having lunch at the Hoboken Charter school on Tuesday April 19th. 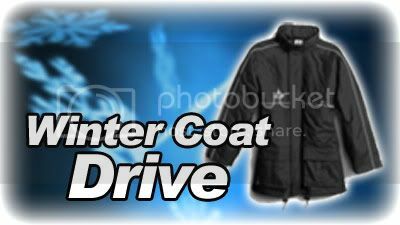 How Much: $10.00 per person, all monies will go towards two charities chosen by the Interact club. There is no meeting on Tuesday, instead we will participate in the traditional County Assembly held at Casino in the Park, Thursday March 17th. This is a great event with all types of food, and a chance for fellowship with other Rotarians . 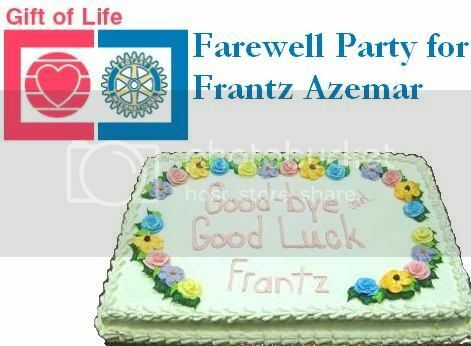 Ron Zimmerman (2010 Rotarian of the year) will be reviewing the entire program. As a club we are looking to get more members involved. Come hear from Ron how great of success last year was and how we plan to make this year even better. Where: Maxwell's located at 1039 Washington St.
Where: Grimaldi's located at 417 Washington St.
On Tuesday November 9, 2010 at 12pm Simeon N. Cumberbatch will be speaking to the Hoboken Rotary Club. The meeting will take place at the Brass Rail on the corner of 2nd and Washington in Hoboken, NJ. Simeon N. Cumberbatch will be speaking about N.J.'s 'energy choice' program that allows families to choose their energy supplier. How Viridian, which has 20% and 100% 'green energy' supplied by windmills in PA, is the greenest energy supplier in N.J., and how they are able to supply individual families with affordable energy. Not only does the individual enrollee (with no contract, no minimum, and no cost) save money, but they are able to help their chosen non-profit earn passive residual monthly income every time they pay their monthly electric bill. Through November we will be collecting food from the farmers market. On Tuesdays downtown around 7pm we are collecting food from the farmers. In the past the food that wasn't sold was being feed to the animals or thrown away, now the Rotary club is collecting and delivering the food to homless shelter. For more information or to get involved please contact Diana Foxwell or Joe Mindak. We had great feedback about our event last year at Essex County Country Club, so decided to keep the venue the same! We'll be having our special cocktail hour and dinner (in the newly remodeled Clubhouse) after the outing. 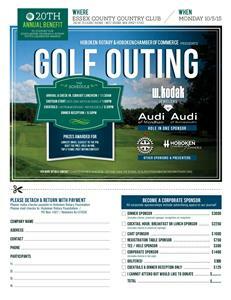 You don't have an excuse not to join us, if you don't like golf, come to network with other professionals! The Rotary has officially changed their meetings back to 12:15 on Tuesdays starting in March. We will be meeting at Biggies Clam Bar(formerly The Clam Broth House) in the private room downstairs. Come join us and see what the Rotary has planned. Details are still being worked for this event; however tickets are going to be $25.00 each, which will include lunch. There is a panel between four and six speakers discussing various economic situations that are facing Hudson County. 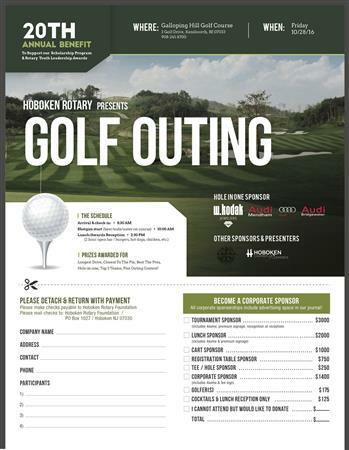 Please contact events@hobokenrotary.org for more information. I would personally like to thank Rory, Joe, Marie, Lisa, Ron Joe as well as all our members who made this event successful. Press Release Thank you letter from Hoboken Charter, we are in the working on scheduling a check presentation and working with the school to determine if there are any opportunities for us to volunteer. This event is open to anyone and please feel free to invite anyone who you believe is interested in networking. Well Rotary never seems to have a lack of exciting events. On the 10th we had our 17th Annual Golf Outing as we were blessed with some amazing weather, along with nearly ever golfer who registered showed up. On Tuesday we had our regularly scheduled meeting and Rich Marsh assisted us with the Homeless Bag Project. This project, which entails packing fifty bags with daily essentials, one for everyone who spends a night at the shelter. After our outing our Community Service Committee began working on our Fund Raiser to help those displaced by the Hoboken Charter School Fire. This event is taking place at The Turtle Club as well as 10th & Willow. We are looking Volunteers to assist us with putting on this event. Please come out and join us in helping Rotary serve our community. "He who serves best, profits most." On Tuesday August 21st, Marie Papp will be our feature member in our second installment of our Member Presentation Series. If you, or you know of someone that is interested in speaking at our club please have them first review the speaker schedule looking for an available date, then complete the speaker request form,. As a member of the club your are encouraged to take advantage of the opportunity to speak in front of your peers to share personal, professional and Rotary experiences. New Badge Order form if you are interested in having a new name badge please complete this form by the end of the week, as the order will be place on Monday August 27th. There is no meeting on Tuesday August 28th, as we are getting together at The City's Annual Spaghetti Block Party, tickets are $15.00 each and can be reserved here, we only have two tables reserved and there are only a few tickets remaining. I look forward to seeing each of you tomorrow evening at 6pm at the Brass Rail. We are looking forward to having a terrific evening to celebrate Chris Mackin and all the amazing job he performed as our club president. This year we are having it at Clinton Social, on June 19th. 2012. The cost is $55.00 per person, and social hour starts at 6:30pm and the program will be starting around 7:15pm. The Leadership Team works very hard putting together a complete list of programs for our meetings. We are always looking for both your feedback as well as new speakers and topics. If you have any suggestions or know anyone that is interested in being an up coming speaker please contact speakers@hobokenrotary.org. First I would like to say thank you to all every member that showed up at The Gaslight for the last Rotary meeting of the 2011 year. Our weekly attendance is on the up swing and we ended with 19 people attending. I appreciate every member that has been attending meetings on a regular basis, as a club we look forward to continually increasing our attendance in 2012 and beyond. 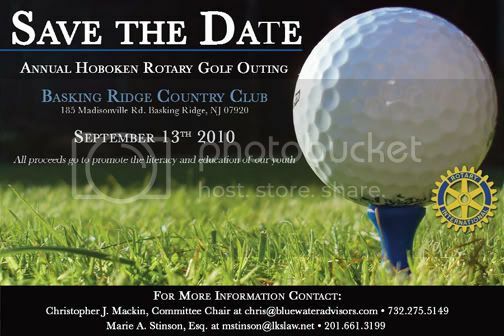 If you have been attending any make up meetings please email makeupmeetings@hobokenrotary.org by the end of the year. On January 3rd will be meeting at The Brass Rail at 12pm. Please remember to invite a guest or and refer anyone that you think may be interested in being a program. We happy to announce that Chris Mackin started his year as Presiday on Friday July 1, 2011. He is keeping the tradition of having a closed club assembly with the first meeting in July. We conduct this meeting to brain storm for various project's for the year as well as give the President an opportunity to introduce their leadership team, their roles, and Chris 2011-2012 vision. We are looking forward to a very exciting Rotary year, as our club celebrates its 90th Birthday in November. Purchase your tickets and sponsorships today for the 7th Annual Art Auction and Wine Tasting. Read more about this past Spring's Art Auction and contact Ryan Mitchell for more information. Come celebrate the installation of the 2011 - 2012 Leadership team. For those of you that haven't left town yet for the holidays please join us at the Gas Light at 12:15pm for Bob Brady's "Stange and interesting facts about Past Hoboken Rotary Presidents"
Vince Lombardo is Director of Fund Development and Public Relations for United Cerebral Palsy of Hudson County. UCP of Hudson County, Inc. is a private, non-profit organization that has been providing an array of advocacy and support services to individuals with developmental disabilities and their families throughout Northern New Jersey since 1951. UCP’s services are provided free of charge to individuals who are registered with the Division of Developmental Disabilities. Currently, UCP of Hudson County serves over 400 individuals and their families on a daily basis through a comprehensive network of advocacy and support services. Click on the link below to enjoy pictures of the Annual Rotary Golf outing. 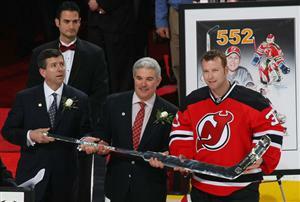 Great day for everyone involved. Rotary 2010 Golf Outing Pics!!! Join us for our next meeting on October 5th at the Gaslight. Meeting will be held from12:15 to 1:15pm. Guest speaker Elizabeth (Betty) Spinelli is the Executive Director of the Hudson County Economic Development Corp. For more information log on to hudsonedc.org. Former District Governor Joe Dino visits!!! District Governor Adele E. Miller visits the Hoboken Rotary. Our speaker and fellow Rotarian, Elizabeth Essoka from the west African country of Cameroon spoke about this year's Rotary theme, "Building Communities, Bridging Continents." She shared tasty Cameroonian cuisine with the club, and Hoboken Rotarians supported her youth programs in Cameroon by purchasing items made by students in her youth programs. 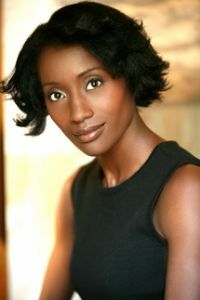 Beatrice Johnston, our speaker on July 20th is the director of Brand Excitement, a social media marketing company. In her role, she leads the design of marketing materials, websites, blogs and social media messaging that helps companies express passion, excite people and expand profits. She shared with the club several social media strategies that could be implemented immediately to boost our online presence and brand. To obtain the handouts she distributed, please contact her at bea@brandexcitement.com. 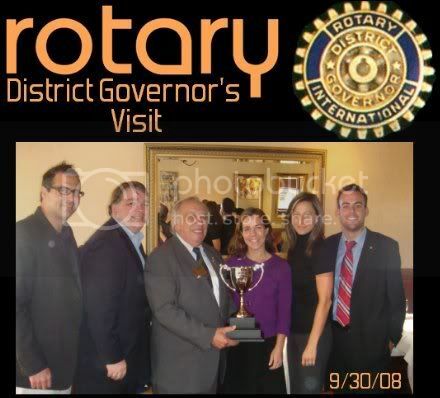 Join us for our next weekly Rotary meeting on Tuesday evening at 6pm at The Hoboken Bar & Grill, 230 Washington Street. 201.222.6050. 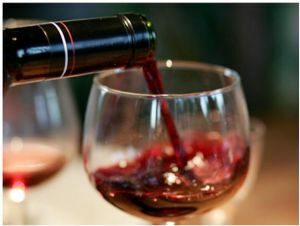 $25 for three courses and one drink.